Tony Greenstein's Blog: Free Khalida Jarrar Now! Khalida Jarrar, Palestinian leader, parliamentarian and feminist, has been issued a six-month administrative detention order imprisoning her without charge or trial, at the behest of the Israeli military commander in the West Bank, reported Addameer Prisoner Support and Human Rights Association – Jarrar’s lawyers – on April 5. 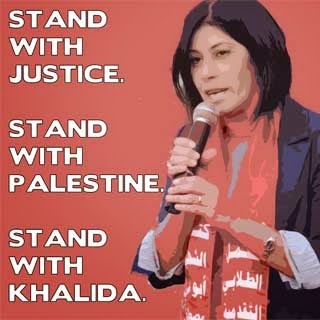 TAKE ACTION: Demand freedom for Khalida Jarrar! Mahmoud Hassan, lawyer with Addameer and director of its Legal Unit, reported that a military court session at Ofer will confirm the order on Wednesday, April 8, 2015. 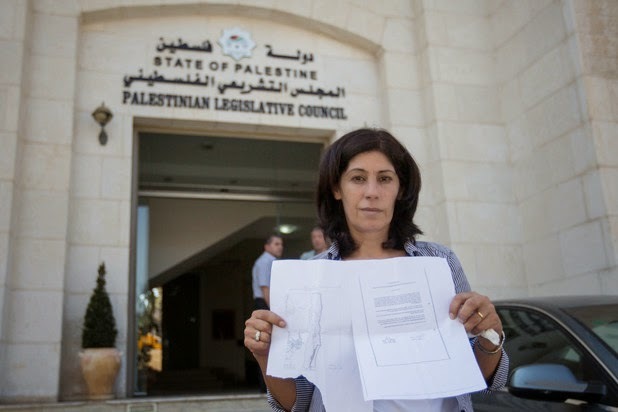 Jarrar is the former Executive Director of Addameer and Vice President of its Board of Directors, as well as the chair of the Palestinian Legislative Council Prisoners’ Committee and a member of the Palestinian national follow-up committee for the International Criminal Court. In response to the order, Addameer noted that the use of administrative detention by the Israeli occupation is illegal and arbitrary detention and amounts to a war crime, “willfully depriving a prisoner of war or other protected person of their right to a fair and regular trial.” It urged the international community to work hard to end arbitrary administrative detention and free all Palestinian prisoners in Israeli jails. Hassan said further that he visited Jarrar this morning in HaSharon prison, that she is in good health and taking her prescribed medication, but that she needs ongoing health care. She is now one of nine members of the Palestinian Legislative Council held without charge or trial under administrative detention orders. Administrative detention is the imprisonment of Palestinians without charge or trial and on the basis of secret evidence for up to six month periods, indefinitely renewable by Israeli military courts. The use of administrative detention dates from the “emergency laws” of the British colonial era in Palestine. Israel’s use of administrative detention violates international law; such detention is allowed only in individual circumstances that are exceptionally compelling for “imperative reasons of security.” In Palestine, however, Israel uses administrative detention routinely as a form of collective punishment and mass detention of Palestinians, and frequently uses administrative detention when it fails to obtain confessions in interrogations of Palestinian detainees. Jarrar is a long-time Palestinian political prisoners’ advocate, former executive director of Addameer Prisoner Support and Human Rights Association and a member of its board; she chairs the Prisoners’ Committee of the Palestinian Legislative Council. She is also active in the Palestinian women’s movement, a feminist and prominent voice for the defense and expansion of women’s rights. Jarrar has been a visible and prominent participant in the West Bank demonstrations in support of Palestinians in Gaza, denouncing the occupation military’s killing of over 2,000 Palestinians. Since 1998, she has been forbidden to travel outside occupied Palestine; when she needed medical treatment in Jordan in 2010, she struggled for months in a public campaign before finally receiving her treatment. Thousands of organizations and individuals from around the world took action in August-September 2014, declaring that they stand with Khalida Jarrar and demanding the cancellation of the “special supervision order” forcibly transferring her from Ramallah to Jericho. Jarrar refused expulsion to Jericho. Instead, she has set up a protest tent in the Palestinian Legislative Council courtyard in Ramallah, where she lived and worke until the order was lifted on September 16, 2014. “It is the occupation who must leave our homeland,” said Jarrar. The tent was visited by numerous Palestinian and international delegations, including international members of Parliament. There are now 16 members of the elected Palestinian Legislative Council imprisoned by Israel, 9 under administrative detention without trial or charge. PLC members have been repeatedly and systematically targeted by Israeli occupation forces. The Khalida Jarrar Solidarity Campaign is being reactivated to demand her immediate release. Israel arrested a Palestinian lawmaker from a left-wing terrorist group on Thursday for disobeying an order restricting her movement in the West Bank. The PFLP organization has been behind a number of attacks on Israeli civilians over a period of some 40 years. As recently as November of last year, it took responsibility for a terror attack in which five people were shot and hacked to death with meat cleavers in a bloody assault on a Jerusalem synagogue. Last year, the military confined Jarrar’s movement to the city of Jericho and its surroundings. Her husband, Ghassan Jarrar, said she was arrested in their Ramallah home. She had long flaunted the Israeli ban. The military said it was questioning her but has not yet decided whether to press charges. Soldiers confiscated two computers and a mobile phone from the premises, according to Palestinian media reports. 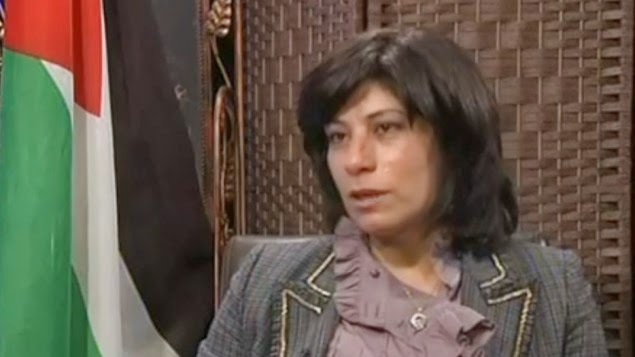 The Palestine Liberation Organization denounced the move and called Jarrar’s detention “illegal” on social media. Jarrar was heavily involved in cementing the Palestinian Authority’s bid to join the International Criminal Court bid, a PLO spokesperson said.